Meal planning has certainly proved an adjustment for me, since when I lived alone, I rarely bothered with meat, a travesty in Dan's eyes. Figuring out how to add a little meat in our meals to keep Dan satisfied but also create a meal substantial enough for me poses a challenge, especially since Dan does not care for tofu, mushrooms, or eggplant, ingredients commonly used in vegetarian cooking to mimic meaty umami flavors. I find Mark Bittman's approach helpful: Use meat as an accent, not as the primary component of the meal. Dan may miss the elaborate pork roasts and stews he grew up on, but I think this philosophy keeps each of us reasonably happy. We consume more vegetables, spend less money, reduce our environmental footprint, and consume less animals. Win, win, win, win, right? 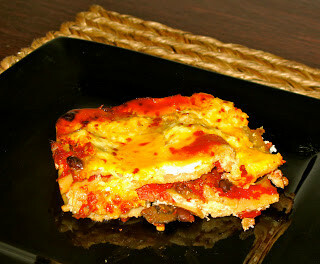 Granted, the lasagna may not be the most beautiful dish, but we both deemed it an overall success. I had hoped to offer a profound remark about how relationships sometimes require that we make space for the other and that we meet one another in the middle, but even I could not take myself that seriously. Better said, I think sometimes all relationships need is a little pepperoni. 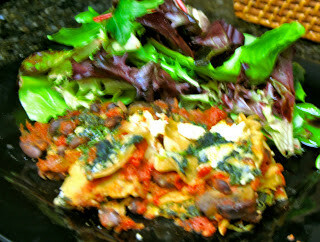 Recipe adapted from Southern Living's Spinach-Black Bean Lasagna. I halved the amount of cheese filling because it seemed overly heavy and left the frozen spinach out of Dan's half. Stir together first 2 ingredients and 1 cup Monterey Jack cheese; set aside. Divide the mixture into two bowls and stir spinach into one of the bowls. Mash beans with a potato masher or fork in a large bowl; stir in pasta sauce and cumin. Spread one-third of bean mixture on bottom of a lightly greased 13- x 9-inch baking dish. Layer with 3 noodles and some of spinach mixture on one half of the pan. 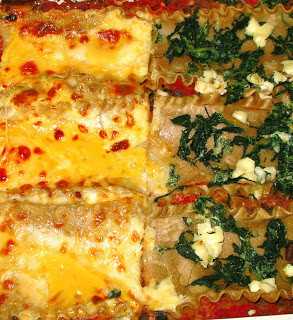 On the other half of the pan, add spinach-free ricotta mixture, extra cheese, and pepperoni. Repeat layers with the remaining noodles, sauce, pepperoni, cheese mixture, and cheese. Bake, covered, at 350° for 1 hour; uncover and top with remaining Monterey Jack cheese. Bake 5 more minutes or until cheese melts. My contribution is less a recipe than a method or logic. Dan would confirm that a sprinkling of bacon or a few slices of cured meat can go a long way in determining whether a meal is a success or failure in a meat lover's eyes!